Posted on Sat, Oct 29, 2011 : 7:07 p.m. Freshman linebacker Desmond Morgan brings down Purdue wide receiver Raheem Mostert in third-quarter action. Michigan football coach Brady Hoke talked at length this week on how he expected to find more playing time for a handful of freshmen. But that doesn't mean Hoke necessarily likes it. "I'm going to kill one of them," Hoke said with a smirk, declining to explain which player he was referring to. "Read it in the obituaries." Freshman cornerback Blake Countess started against Purdue and finished with three tackles. Hoke was half-kidding, of course. He said the freshmen earned more playing time, and though they're still learning, Hoke was impressed with their efforts. "They're playing hard," he said. "There's some talented guys (there)." Freshman linebacker Desmond Morgan earned the start at weakside linebacker and posted a team-high nine tackles. Freshman cornerback Blake Countess, who had been playing more each week, earned his first career start and finished with three tackles, including one for a loss. First-year strongside linebacker Brennen Byer was expected to play more, he did, finishing with two stops. Rookie defensive end Frank Clark also saw extended time, finishing with one tackle. "Blake is a talented guy with a good instinct, Desmond does, too, so does Frank Clark and Brennen Byer," Hoke said. "It's great that they're getting all the time that they are, and they have a great attitude." Playing so many freshmen at once could obviously be considered a major risk. But Michigan isn't exactly overflowing with depth, and Hoke insists that he's going to play the best players he has. "I believe you put your best players on the field," he said. Is he concerned about putting a defense on the field half-full of first-year players? "Nope," he said. "I don't have any concerns about it, because of how they play and how they practice." With a first-quarter interception Saturday, Michigan junior quarterback Denard Robinson now has as many interceptions this season (11) as he did all of last season. Robinson's interception came on a third-and-four play from the Purdue 43 midway through the first quarter. He attempted to fit a ball to tight end Kevin Koger between two defenders and was picked by Purdue's Joe Holland. In the second quarter, sophomore quarterback Devin Gardner threw his first career interception in the second quarter, as he badly overthrew a deep ball down the middle into the arms of Purdue's Josh Johnson. Robinson moved up another Michigan career record list Saturday. His 2-yard touchdown run in the first quarter was the 29th of his career, tying him with former running back Butch Woolfolk, father of current Michigan cornerback Troy Woolfolk, for ninth place all-time. Robinson is one rushing score away from tying Billy Taylor and Heisman Trophy winner Tom Harmon for seventh place. Former running back Anthony Thomas holds the school's career record with 55 rushing scores. The game ball for the Michigan-Purdue game was delivered in a futuristic manner on Saturday: via rocket pack. Powered by a hydrogen peroxide jet pack strapped to his back, pilot Eric Scott flew from atop of southeast end of the Michigan Stadium to above the uprights in the north end zone before circling back around and delivering the ball at midfield. The scene seemed straight out of "The Jetsons" or "The Rocketeer," and Michigan fans received Scott with a rousing ovation. Scott is in the Guinness Book of World Records for speed in a rocket pack (68 mph) and distance traveled (1,500 feet) in a single flight. Michigan improved to 21-5 in its last 26 meetings with Purdue. The Wolverines hold a 43-14 edge in the series. ... Legendary late Michigan tight end Jim Mandich was honored during a stoppage in the first quarter. Mandich, a College Football Hall of Famer, caught 118 passes for 1,489 and six touchdowns at Michigan from 1967-69 before embarking on an eight-year NFL career. Mandich died in April, and he was represented on the field by his family. 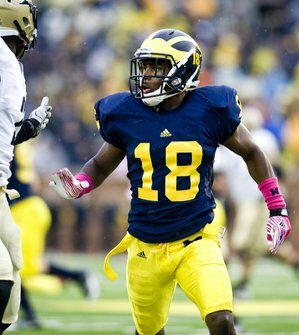 ... Several Michigan players wore pink wrist bands and ankle tape Saturday in support of breast cancer awareness. Sun, Oct 30, 2011 : 1:28 p.m. They still need speed at the DE &amp; LB positions even with the recruits coming in. Sat, Oct 29, 2011 : 11:45 p.m.
Man our Defense will be incredible in a year or two....tons of young playmakers and more coming in on recruiting. Its great to be a Michigan Wolverine.